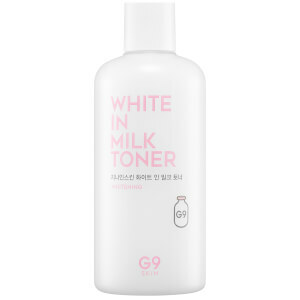 Improve your skin's overall appearance with the White In Moisture Cream from Korean brand, G9SKIN. Absorbing quickly, the rich-textured formula utilises whitening, brightening and soothing ingredients to promote a radiant, healthy-looking complexion. Harnessing the powers of Niacinamide, Milk Protein Extract and Shea Butter, the nourishing cream delivers long-lasting moisture and hydration, whilst the brand's innovative G9 Complex defends against pollution and environmental aggressors. Skin looks smoother and more refined with an airbrushed finish. Suitable for face and body. Påfør på ren, tørr hud i ansiktet eller på kroppen.